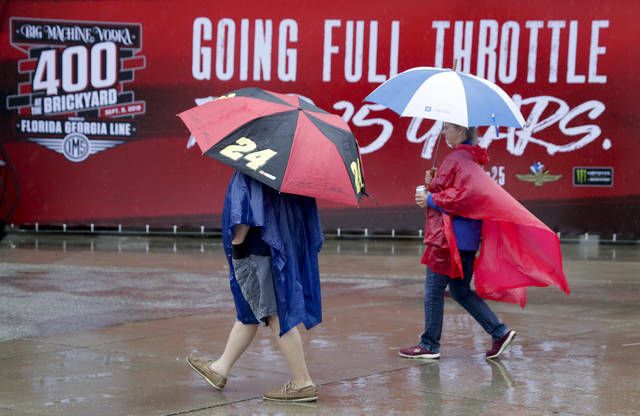 INDIANAPOLIS (AP) — Jimmie Johnson doesn’t have a playoff spot locked in as the seven-time NASCAR champion prepared for rain-drenched Indianapolis Motor Speedway and the final race of the regular season. Johnson is in a 48-race losing streak headed into the Brickyard 400 and his Hendrick Motorsports team has been inconsistent all season. It’s put him up by just 19 points over Hendrick Motorsports teammate Alex Bowman in the battle for the 15th position on the playoff grid. That should be enough to get Johnson into the playoffs, but a surprise race winner could jumble the final berths. Johnson is a four-time winner at Indianapolis and even in a crummy season, he doesn’t discount how quickly things could flip for the No. 48 team. Johnson won his seventh title in 2016 and despite three wins last season, he peaked in the first quarter of the year and was 10th in the final standings. His last victory was at Dover on June 4, 2017. 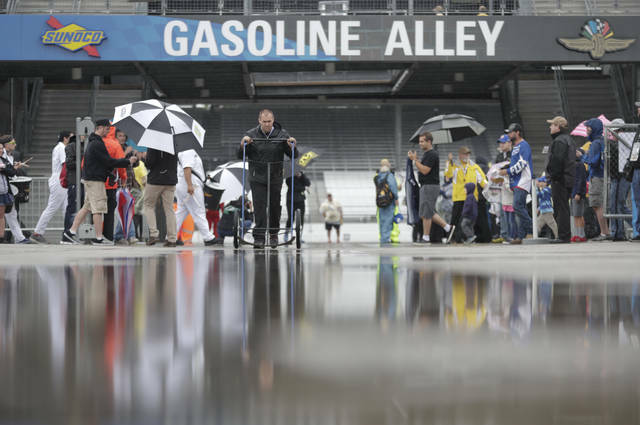 NASCAR moved the regular-season finale this year to Indianapolis as officials from the sanctioning body and the track tried to make the Brickyard a bigger draw. The race has struggled for much of the last decade in its traditional summer slot in part because of heat, lack of on-track action and low stakes. As the 26th race on the schedule, though, the show has increased meaning because it will finalize the 16-driver playoff field. But expectations have been doused, first by the NFL scheduling a home game across the city for the Indianapolis Colts, then a torrent of rain that disrupted all activities at the Brickyard. 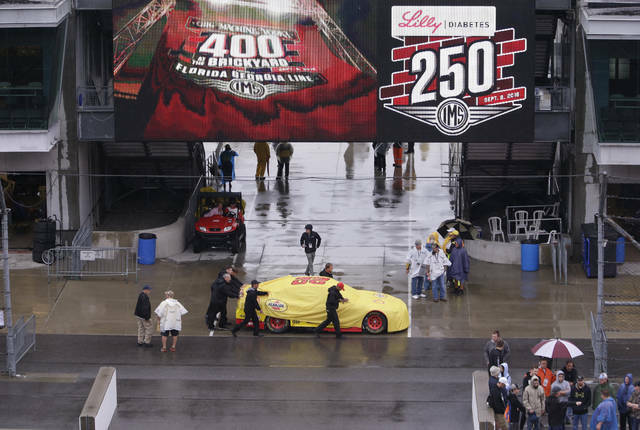 All activity was washed out both Friday and Saturday, including Cup qualifying. The field was set by points with Kyle Busch, Kevin Harvick and Martin Truex Jr., the so-called “Big 3” this season, lined up first through third. The washout Saturday prevented teams from getting any track time prior to the race and all will start with setups based off notes. But all previous experience was during July, when the temperature made the surface of the track hot and slick. The move to September should favor drivers, particularly as they adjust their cars. WHO IS IN: A victory in the regular season earns a driver an automatic berth into the playoffs and 10 drivers have already locked up spots. They are: Kyle Busch, Kevin Harvick, Martin Truex Jr., Clint Bowyer, Kurt Busch, Joey Logano, Brad Keselowski, Chase Elliott, Erik Jones and Austin Dillon. Four drivers — Kyle Larson, Ryan Blaney, Denny Hamlin and Aric Almirola — are locked in by points. SITTING OUT: Defending race winner Kasey Kahne won’t race at Indy because of problems he’s having with heat exhaustion. He was treated after his win last July and has struggled at various times with dehydration and an elevated body temperature. Regan Smith with drive for Kahne, who isn’t sure when he’ll be back and is retiring at the end of the season. REGULAR-SEASON CHAMPION: Kyle Busch and Harvick are racing for the bonus that goes to the regular-season champion. Busch needs only to finish 15th or better to win that portion of the season. PENSKE SWEEP: Ryan Blaney is the only one of the three Team Penske drivers without a Cup victory yet this season and wants it at Indianapolis. A win by Blaney, Brad Keselowski or Joey Logano would give boss Roger Penske a sweep at the Brickyard this year. Penske driver Will Power won the Indianapolis 500 and on the road course in May.